Corinthian, which operates under the school names Everest, Heald, and Wyotech, is under investigation by the federal Consumer Financial Protection Bureau and at least six state Attorneys General. Corinthian has been been accused of falsifying records. Its tuition costs are as high as at top private universities, yet two-thirds of its associates degree students drop out, and three-quarters of its students can't pay back their loans. The company receives about 90 percent of its revenue from taxpayers, and it spent between $5 and $10 million of that money fighting in Washington against minimal standards to hold schools accountable for abuses. I had questioned how Panetta, with his distinguished record of service, could endorse a business and an industry with a particularly bad record when it comes to recruiting and educating U.S. troops and veterans. On Monday, Corinthian reported that Panetta has resigned from its board. Panetta had served on the same board prior to joining the Obama administration. This time, he quit after just eleven weeks of service. In a letter to Corinthian CEO Jack Massimino, Panetta explained, "I was struggling with a large number of commitments, requests and obligations on my time. Unfortunately, they have demanded a much greater time commitment than I had anticipated and made organizing my life more difficult." I believe in and support the educational role of Corinthian in delivering educational opportunities to those that otherwise would never have a chance to succeed. It is also obvious that the role of Corinthian is going to be continuously challenged legally and administratively because of what appears to be a slanted and misinformed attitude toward this form of educational opportunity. I guess the slanting and misinforming is coming from people like Mr. Panetta's former boss, Barack Obama, who has warned military service members that some for-profit colleges "aren't interested in helping you.... They are interested in getting the money... trying to swindle and hoodwink you." Whatever, though -- Panetta quit Corinthian almost as soon as he joined. Whatever his reason, it's good that he no longer stands as a validator for this troubled company, especially when it comes to signaling our troops and vets. Perhaps it is relevant that Panetta's son, Jim, has announced plans to run for his father's old House seat when the incumbent retires. Jim Panetta, a deputy district attorney, is a decorated Naval officer and a strong advocate for veterans. 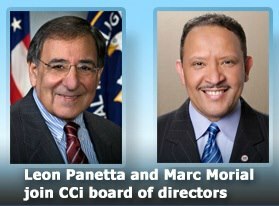 Panetta's resignation comes just weeks after Admiral Mike Mullen, former chair of the Joint Chiefs of Staff, did not appear after being announced as the keynote speaker at the annual convention of the for-profit college trade association APSCU. I had called on Mullen to cancel that appearance, in light of his long-standing commitment to veterans education, although the reasons for his non-appearance weren't disclosed. Panetta and Morial each received Corinthian stock options at the end of June, 20822 shares each, which were to fully vest at the November 2013 shareholder meeting. Corinthian shares are trading at about $2.50 now, so that haul would be worth about $47,000. That would be a huge sum for one of the thousands of former Corinthian students who are deep in debt, but it may not have been enough for Panetta to outweigh the reputational burdens of associating with such a troubled institution. So what about Marc Morial? Last year, Morial's Urban League accepted $1 million in aid from Corinthian. The Urban League's mission is " to enable African Americans to secure economic self-reliance, parity, power and civil rights." Corinthian's record shows that it accomplishes just the opposite -- it takes students' money and often leaves them deep in debt without giving them real training for a better career. Fortunately, low-income communities have other strong advocates standing up against the abuses of for-profit colleges. Morial, a former mayor of New Orleans and an inspiring national spokesperson on issues of the day, like the Trayvon Martin case, should stand with these leaders. He should quit the Corinthian board now. If he doesn't, Urban League board members like former U.S. cabinet secretaries Alexis Herman and Rodney Slater should consider the issue.